I missed “Act I” of this exciting group show curated by Prem Krishnamurthy and Carin Kuoni, but traces of the eleven-day installation by HOWDOYOUSAYYAMINAFRICAN? remain in the gallery for “Act II,” on view now. 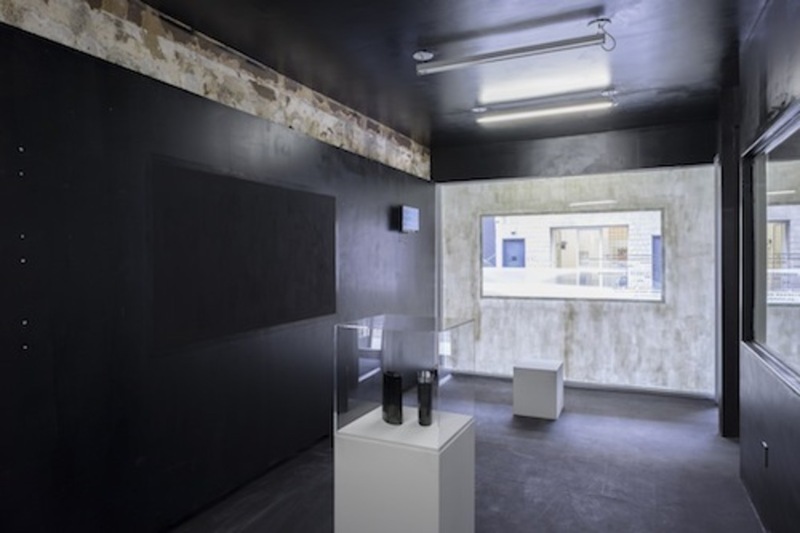 The walls are still painted black, and an edit of the art collective’s timely, twenty-four-channel video piece The Wayblack Machine, 2014, plays on a single monitor. It’s a moving montage of material culled from news sources and social media about the police killing of unarmed black teenager Mike Brown in Ferguson, Missouri, on August 9. Art’s turnaround time doesn’t often allow for immediate responses to world events, so it’s satisfying to see something made with such apparent urgency on the fly. Slideshows of newly iconic photos—protestors’ hands up in defiant poses of surrender, teargassed faces, tanks—are interspersed with digitally animated tweets that swirl into hashtagged gibberish. The YAMS installation was billed as the launch for a new Internet archive, thewayblackmachine.net, but that URL takes you to a low-res splash page, a dead end. Maybe the radical project of building a digital repository for the documentation of “activism around black embodiment,” as the press release reads, is a kind of joke, purely conceptual—or speculative, at least for now. The show’s funniest work is Lynn Hershman Leeson’s Synthia, 2000–2002, which literalizes the hysterical market fluctuations on which financial speculation relies. A tiny monitor hangs from a chain in a bell jar, showing real-time market data and video clips of a woman in corresponding states of mind. I visited the gallery on a bad day for Wall Street, I guess: Mostly, Hershman’s character slumped on a couch drinking alone. There’s a surprising thread of humor to “Post-Speculation.” While the black walls remind us this is Ferguson October, they don’t dampen the prankish synergy between the works assembled.